I absolutely love my shuttle collection! I've actually used about 2/3 of them for some project or another, but I know that shuttle collecting isn't for everyone. If I weren't able to collect shuttles, I'd be perfectly happy with my Clovers. They're light, and the pick is easy to use. The only time I don't like using them is when I'm tatting with size 10 thread... I run out of thread way too quickly! I pulled my Learn to Tat by Janette Baker off the book shelf over the weekend, and I decided to use up some bits of thread on two of my Clover shuttles. I love the Easy Bookmark and Heart patterns. They're simple, yet very pretty. I guess that's the nature of tatting! Oh, dear! I see some thread emerging from the green shuttle! I guess I'm going to have to empty another shuttle! P.S. - Easy Bookmark is #5, and Heart is #6 for the 25 Motif Challenge. We've had unbelievably cold temperatures here in Chicagoland... so cold that school was closed on Thursday and Friday. So, what did I do with my free time? A little bit of everything! I emptied some more tatting shuttles. The myrtlewood shuttles are from Grizzly Mountain Arts. The ceramic shuttles are from LadyShuttleMaker. As you can see, I tatted some more Leaf Braid from Tatting with Visual Patterns by Mary Konior. I also tatted some Easy Edge from Learn to Tat by Janette Baker. I also decided to work with my rug loom since I had such success making the rag placemat. The loom is 2' x 3'... a nice size rug! Here is the loom all warped and ready to weave! I need to cut strips for weaving, which I'll probably do on Monday. The placemat took me two full days to make, so I'm sure the rug will take a while. I also decided to make some more Springerle cookies, using each of my molds and my rolling pin. This picture is of the cookies drying for about 10 hours. I made lemon flavored ones this time. Carol liked these a lot, and they are good, but Dave and I both prefer the anise flavor. These are the first two molds I bought. I love the little pictures! I bought the rolling pin after I made my second batch of cookies. The rolling pin will take a little practice, but I'm sure I'll get my technique down with each new batch. The cookie stamp was a Christmas present from my sister-in-law, and it makes the perfect size cookie! I hope I get some more of these as Christmas presents next year... they're wonderful! I also worked on Dave's afghan. Yesterday morning it was 40" long... it's supposed to be 60". I figured out that I need 10 more pattern repeats. I've finished 1 1/2 pattern repeats since I last measured. The end is in sight! As if that isn't enough, I started knitting Evelyn A. Clark's Swallowtail Shawl. If only I could stay focused on one thing! Of course, I'm never bored, because I can flit from one project to another. Maybe I have fiber art ADD! P.S. - Easy Edge is #5 for the 25 Motif Challenge. I finished my first rag placemat! This was a fun project. It took me two days to complete, including washing, drying, and cutting the fabric. The technique is called twined weaving, and I purchased the loom, book, and DVD from henscratchquilting.com. I love rag rugs, and I've been wanting to learn how to make them. This wasn't the kind that I originally had in mind, but I think this type actually is perfect for me! I have a rather large stash of fabric that I'd like to use up, and this seems to be the ticket! A placemat takes 3 1/2 yards of fabric; a rug takes 15 yards of fabric. I wanted to make a placemat first to perfect my technique, and I'm glad I did! My new placemat has a home already... on the dryer as a mat for the laundry detergent. Perfect! On the bottom, you can see that I've wound my two newest shuttles from Grizzly Mountain Arts with Weathered Stone HDT from Yarnplayer, size 20. I started my newest Spinning Wheel glass mat (from Tatting with Visual Patterns by Mary Konior) last night. This is another one for my friend Shirlee. She loved her first one! It's so gratifying to give a beautiful piece of tatted lace to someone who truly appreciates it! Boy, am I getting lazy! I didn't even get out of my chair to prepare for this blog entry! My camera was on the table to the left. My tatting was on the table to the right. My laptop was on the footstool in front of me, and... ta dah! Pictures for my blog! As you can tell, this is a fairly large shuttle. My hand is 6 3/4" long, and the shuttle is 3 1/2" x 1" x 1". I didn't fully load it to see how much thread it would hold... just enough to try it out. The thread is Altin Basak size 50, color #3004, one of my favorites! The pattern is Leaf Braid from Tatting with Visual Patterns by Mary Konior. I love Mary's introduction to this pattern: "This is the easiest pattern in the book and probably the most useful!" I've never really used the Leaf Braid that I've tatted, but I love the pattern for using up thread left on shuttles! Back to the shuttle... the tips are very tight, which I like. The gourd material is very slightly spongy, which I also like. I was able to gently separate the tips as I was winding the thread because of this slightly spongy feel. Of course, this meant that it took a while to wind the thread, but I don't mind. I'm not a speed tatter. I tat because it relaxes me, and I know I'm working on beautiful lace. I was also slowed down by the size of the shuttle while I was tatting. That doesn't bother me either. I actually worked for about an hour on another piece, but I read the pattern wrong (forgot to make a necessary turn! ), so I cut off my mess and started the Leaf Braid. I'd say, if you like working with a Tatsy-sized shuttle or one of LadyShuttleMaker's larger shuttles, you'd enjoy this one. I don't use my Tatsy or Tatsy-sized shuttles all the time, but if I'm working on a large project, I do like working with one continuous thread... I really don't like adding new threads or hiding ends! Beyond that, I think this shuttle is a great addition to my collection because it is unusual! No regrets here! Jane asked me to let her know how I liked Presencia Finca, which I bought online. So, I dutifully neglected Dave's afghan and tatted up a bookmark. I didn't really neglect Dave's afghan... I did knit 4 rows. 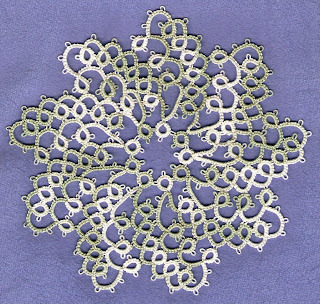 This is an adaptation of Mary Konior's Flower Fragment from Tatting with Visual Patterns. Have I mentioned that this is one of my favorite books? The thread is Finca #16, color #7644. Don't ask me why I chose this color. I don't really care for orange, and I don't think it fits a floral motif very well, but it is what I used! I can't say this is my favorite thread. After all, I am a confirmed HDT addict! Aside from that fact, this is not a bad thread. I agree with Steph... the colors are beautiful, and this size tats nicely... not bumpy like thicker perle cotton. There were a few slubs, but I was able to work through them because they weren't too big... more like fuzz lumps that pulled away fairly easily. I admit that I had a prejudice against perle cotton. I had bought some of the thicker DMC perle cotton a few years ago. The bumps made it nearly impossible for me to tat. But this past summer, my mom gave me some of her perle cotton that she uses for weaving. I tried tatting with it, and I really liked it. That experience made it much easier for me to try the Finca. So, dear Jane, I think it's worth a try! Now, on to trying out the shuttle for Clyde! P.S. ~ This is number 3 for the 25 Motif Challenge! Another new shuttle and some beautiful thread! I know I've mentioned before that I love to shop online. Part of the reason is that it takes me a half hour at least to get to any shopping, and that doesn't include places I love like little yarn shops! Every once in a while I do a search on eBay, Etsy, or Google for tatting shuttles and find something new that I just have to have. That was the case with this little beauty! I found it at http://stores.ebay.com/Alexandra-Beatty-Designs. It's made out of a gourd! It's 3.5" x 1" x1", painted, and sealed. The last time I looked at this shop, there was a shuttle with a giraffe pattern on it... very cool! She also had a plain shuttle listed, just perfect for decorating yourself... if only I had a flair for design! I just had to have some of the thread when I saw these beautiful jewel tones! (Sorry for the glare on the pictures... I haven't figured out how to eliminate that.) Have any of you ever worked with it before? Now, if I only had a little more time! I've become a bit of a wimpy hermit in the past year. If it's slick or extremely cold, I don't leave the house without a helping hand. I admit it... I have a fear of falling again! However, I don't like being out of touch, so I spend probably an hour or two online most days. I like to see what others are doing... it keeps me inspired! I also love to shop online! Luckily, I'm strong enough to set limits for myself every month. I'm sure I could get into big trouble really quickly! I really have a lot to do tonight, but I couldn't help taking time to tat Marilee's Flower Bookmark, my second entry for the 25 Motif Challenge. I still have size 20 Flora #66 on my shuttles, and I'm determined to empty as many shuttles as I can this year without unwinding the thread! Here it is! My first entry for the 2009 version of the 25 Motif Challenge! I'll bet you're surprised to see a Spinning Wheel glass mat! This one is in Flora #66, size 20. If you haven't visited my blog before, the pattern is from Tatting with Visual Patterns by Mary Konior, one of my favorite patterns from one of my favorite books! I have lots more to blog about... new shuttles, new thread, etc., but I'm short on time, so this is it for today. More later! Some of you already know that Dave and I agreed not to exchange Christmas gifts this year. Then, low and behold, I returned home from school the Friday before Thanksgiving to a kitchen full of lumber... hickory, to be exact! After dinner, Dave would say he was going downstairs to work on "The Project." I did try and trick him into telling me what it was a couple of times, but Dave is very good about keeping secrets! Alas! I had to come up with a Christmas idea for my husband after all! I decided on an afghan that my mom had made last year. It was a free download on the Internet, and believe me, I have plenty of yarn in the house! The Sunday before Christmas, Dave and I admitted that there was no way either of us would finish our Christmas projects in time for the big day. What a relief to both of us! Dave finished up his surprise this morning. He and Carol hung the cabinets yesterday, and then he worked on the shelves between the two cabinets and on the end. I am nowhere near being done. I measured his afghan this morning... 35 inches. It's supposed to be 60". I have a feeling this is going to take most of the winter to complete! As for the shuttles... I like them because they hold a lot of thread. I managed to wind 25 yards of size 20 thread onto each shuttle. However, Jan Stawasz likes to tat with size 10 thread, so the tips are a little too open for working with size 20. It makes it a little difficult to get the twist out of the thread. Also, I find that the material that he uses for his shuttles is very slick, so I wind up dropping them a lot! Maybe what I should do is load the shuttles with size 10 thread and try some of Jan's patterns. After all, that's why he made them!